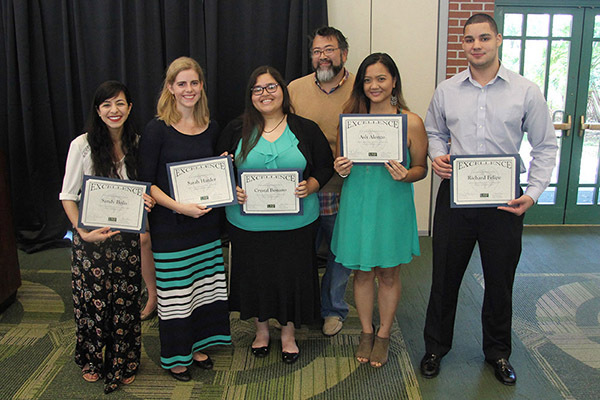 TAMPA, Fla. – The USF English Department’s 17th annual Honors & Awards Ceremony was held in Traditions Hall at the Gibbons Alumni Center on Friday, April 7, 2017. Former department chair, Sarah Deats, launched the ceremony in 2000, and Professor Sheila Diecidue has coordinated each year since its inauguration. English Department chair, Laura Runge, hosted the event for the first time. Runge noted one of her new duties as department chair that particularly brings her joy is reading student evaluations of English instructors. Runge recognized outstanding faculty achievements from the past year, including two Florida Book Awards, a National Book Award nomination, two Fulbright Awards and a number of grants and sabbaticals. Graduate director John Lennon noted the time and effort faculty pour into their work with students. Lennon also spoke on the accomplishments of our graduate students. Runge concluded the ceremony by reading a passage from the poem “Center” by Josephine Miles. Awards and recognitions presented at the ceremony are as follows. Hopler, Jay . (2016). The Abridged History of Rainfall. San Francisco: McSweeney’s. Irizarry, Ylce . (2016). Chicana/o and Latina/o Fiction: The New Memory of Latinidad. Urbana, Chicago, and Springfield: University of Illinois Press. Jones, Steven . (2016). Roberto Busa, S.J., and the Emergence of Humanities Computing: The Priest and the Punched Cards. New York: Routledge. Sukrungruang, Ira . (2016). The Melting Season & Other Stories. New Orleans, LA: Burlesque Press.